Contractor Plus 100 5HW, hot water high-pressure cleaner where there is no electrical supply available. 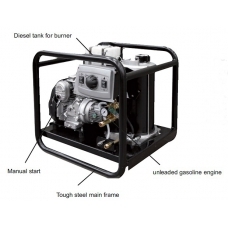 Home » Pressure Washers » Engine Driven Pressure Washer » Contractor Plus 100 5HW, hot water high-pressure cleaner where there is no electrical supply available. Hot water high-pressure cleaner ideal for use where there is no electrical supply available. Direct connection pump / Honda Petrol GC160 Engine. Auxiliary belt driven sturdy alternator. It has a maximum operating pressure of 100 bars - 1450 psi and a maximum delivery rate of 600 litres per hour and weighs 93 Kgs.